Hey Friends! I was asked by one of my Instagram followers to create a low FODMAP slow cooker chicken recipe and I came up with this Cuban Mojo Chicken. After traveling to Miami last weekend to speak at a Gut Microbiome and Diet conference and eating the most flavorful chicken dish at a Cuban restaurant, I was inspired to try a similar recipe at home. Mojo chicken is typically made with a garlic and citrus sauce. I subbed in garlic infused oil to make this suitable for those with sensitivity to garlic on the low FODMAP diet. I used my zester to add a little orange and lime zest, which adds another dimension of flavor. I used boneless and skinless chicken breasts for this recipe. I added the uncooked chicken breast directly to the slow cooker. You can also choose to sear the chicken in a skillet first, if you desire some browning of the chicken. I created a nice flavorful sauce with orange and lime juice, garlic infused oil, cumin and oregano. I also added a little crushed red pepper flakes for just a little heat, but you can opt to leave it out too. 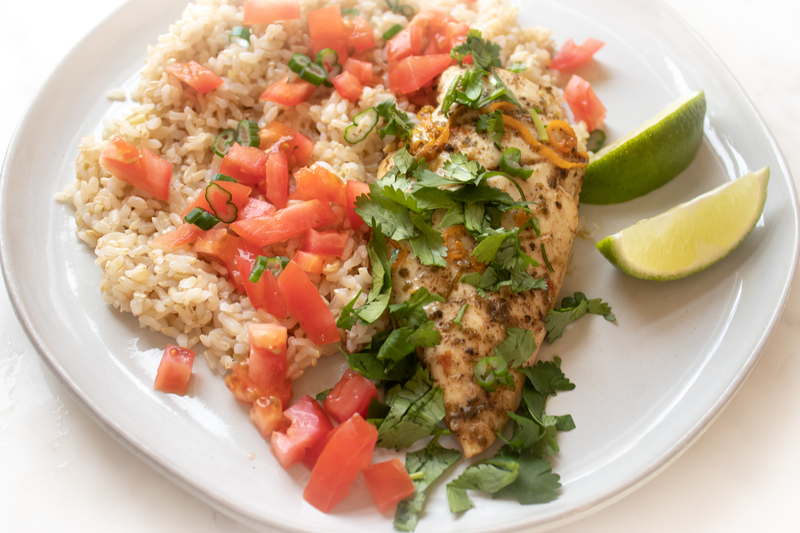 I served this citrus and garlic-y chicken with a side of brown rice that I dressed up with sliced green scallions (green part only) and diced fresh tomatoes. You could also shredded the chicken and use it as taco style meat in a corn tortilla with shredded lettuce and red cabbage or even use the mojo chicken inside a lettuce wrap topped off with a little rice. 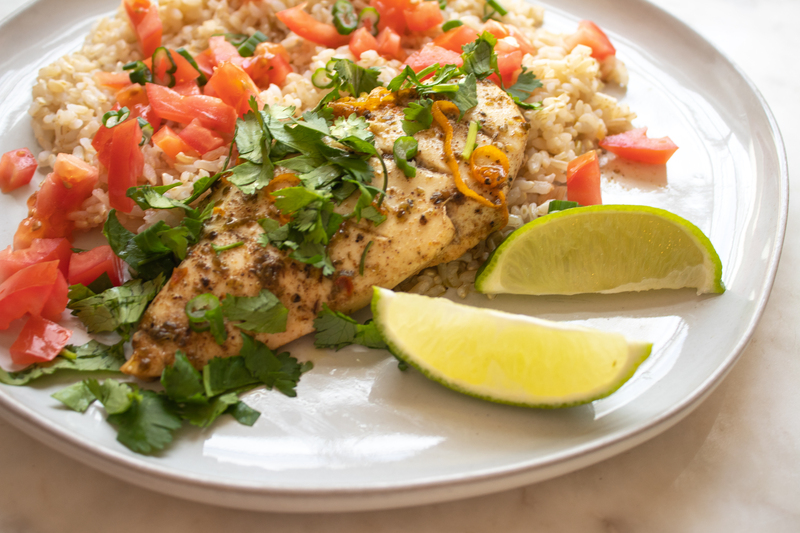 The citrus garlic marinade is quite flavorful and tenderizes the slow cooked chicken. So good. In small bowl, mix orange and lime juice, garlic oil, oregano and cumin. Add salt and pepper, and crushed red pepper flakes, if using. Pour marinade into slow cooker set on low heat and add chicken. Cook chicken for 1 1/2 hours or until cooked through and fork tender. Top chicken with chopped cilantro. Serve with side of rice topped with tomatoes and scallion greens. Add a spoonful of the residual sauce from the slow cooker over the rice and chicken. Thank you for this! I am going to make it this week. So handy for busy week nights. The citrus twist sounds delicious.